'Treme,' Ep. 18: After Mardi Gras : A Blog Supreme There's politically charged funk-rap, New York meets New Orleans, the debut of a new song and classic, swinging jazz. Read a recap of the episode's music, featuring guests Susan Cowsill, Leroy Jones and Dr. John. 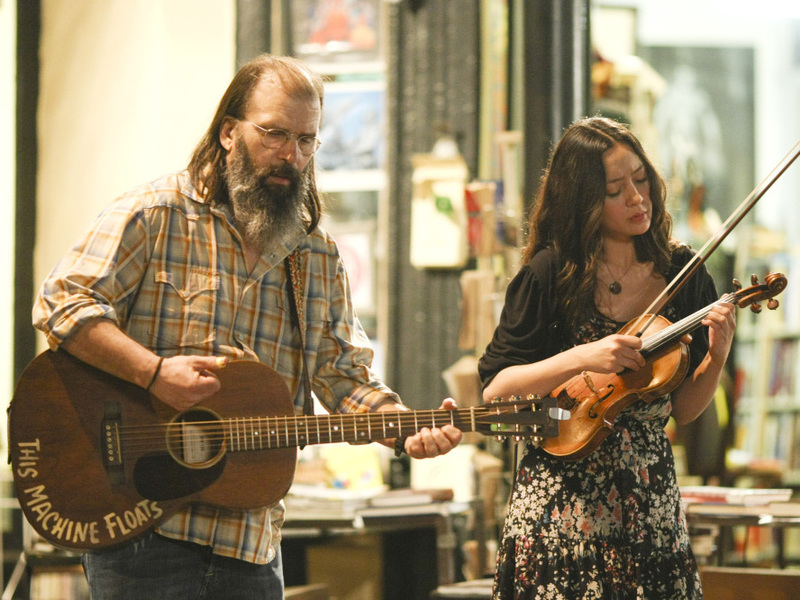 Harley (Steve Earle, left) and Annie (Lucia Micarelli) busk in the French Quarter in Treme. It took a while to notice, but this season of Treme has set up another parallel between the chef Janette and the ranks of musicians. When her chef at Le Bernardin — played by Eric Ripert, the actual chef at the actual restaurant — senses her unhappiness, he points it out. She once had her own kitchen, where she learned to "express yourself," but now, she's working at her "craftsmanship" on another's vision. This year, we're seeing Antoine, Delmond, Davis and Annie all initiating original projects which they front. At least Antoine and Annie have heretofore been career sidemen — now they're learning how to be comfortable in the spotlight, too. In this episode, Annie takes a big step forward to that end. Joining me again to discuss this and other musical questions is WBGO's Josh Jackson. Patrick Jarenwattananon: I don't know about you, but Davis' Brassy Knoll politically charged bounce-meets-brass project has exceeded all my expectations so far. They do that song we heard them rehearse way back when, "The Road Home" — the issue of who gets to move back to New Orleans emphasized in season one is still alive and well. And then they do another tune called "Not One Word," with a little bit of political theater. Josh Jackson: Not bad for a first gig. I'm pretty sure the "Beaver" comment was a very sly way to connect the joke to a certain presidential surname. Satire is great fun, but there's always some uncomfortable grain of truth behind the comic mask. Many Gulf Coast residents harbored nasty feelings about the State of the Union addresses in 2006 and 2007. President Bush, like any other politician, did not cop to the many mistakes that hampered the rebuilding efforts of the area, and there were varying degrees of political will in Washington to really do some nation-rebuilding here at home. No head of state wants to say, "The State of the Union is strong, except people are still suffering in a few states. Sorry about that." That might be a little too real for the spectacle and political theater of that address. PJ: The special guests welcomed in this episode include Susan Cowsill, originally of the family band The Cowsills. She's fronting the band that Annie and Harley are playing in. And I understand she's a New Orleans resident, too? JJ: Susan Cowsill has lived in New Orleans since the early 1990s. As a child singer, Susan was the youngest member of the family band that made big hits in the 1960s. She now possesses a rich and expressive voice, which she sets to her own wonderful songs. We hear two of them — "Just Believe It" and "Crescent City Sneaux." I recommend her latest recording, Lighthouse, which includes a beautiful version of the latter. You should also read Alex Rawls' story about Barry Cowsill in the Oxford American Southern Music issue. Susan has borne her share of Katrina-related tragedy. PJ: This episode gives a lot of face time to Delmond and the fruition of his scheme to make a New Orleans-meets-New York jazz hybrid. He tells Donald Harrison he's been listening to super-old recordings of field hollers and early brass bands and bluesmen, "previous to previous to previous," trying to mine their insights. I especially appreciate Donald's inside joke: "I wonder why nobody ever thought to do that before." JJ: This is another moment in Treme when fiction and reality are in conversation. Donald Harrison is an alto saxophonist, Mardi Gras Indian and one of my mentors. (Donald wrote a letter of recommendation for me to work at WBGO.) He recorded one of the great combinations of modern jazz and New Orleans music, "Indian Blues," for Candid Records. He's also crisscrossed all kinds of genres of music, performing with Eddie Palmieri and Digable Planets and mentoring Notorious B.I.G. There's even his occasional dalliance with the smooth-jazz format as Donald "Cool Breeze" Harrison. As you might imagine, jazz purists cried foul any time he did this. Pound for pound, he's still one of the most knowledgeable musicians to come out of New Orleans. PJ: Of course, there are also the reality-check scenes with Dr. John and Delmond's father. Dr. John's point is that two big chiefs will be in one room together. (Of course, we get a little gratuitous playing from Dr. John — who, to his fellow musicians, is just "Mac.") And Chief Lambreaux's point is that you can't exactly do this if you're haven't lived it. What do you forecast for this band? JJ: Yeah, Dr. John is the stage persona. Mac Rebennack is the man. We hear him play "You Might Be Surprised." Great tune. I'm still waiting for him to publish his own dictionary someday. He's created more neologisms than anyone I know. The recording plan is to include the solidly swinging New York drummer Carl Allen (from Milwaukee) and bassist Ron Carter (from Detroit), and then have Albert Lambreaux chant Indian. Yes to this. In fact, Carl Allen was on Donald Harrison's Indian Blues, as was Dr. John. Ron Carter, of course, makes everything better. Dr. John recommends conguero Alfred "Uganda" Roberts, who played with Professor Longhair and other locals. This band better happen. PJ: And while Delmond is in New Orleans, he stops by the Palm Court Jazz Cafe to play with trumpeter Leroy Jones. (A "Latin tinge" number, as Nelson points out from the audience.) You can hear how nice and round his tone is, especially compared to the more pointed attack of Delmond's trumpet double. I remember that offline, you were once telling me about Leroy. Who else is up in that band? JJ: The Finnish-born trombonist Katja Toivola is the other horn player. Her band, Spirit of New Orleans, recorded with Leroy Jones. They're both also in a band called the New Orleans-Helsinki Connection. Leroy and Delmond are trading exchanges on a Jones original called "Carnival's in Town." Incidentally, that's Nina Buck, the owner of Palm Court Café, introducing the band. 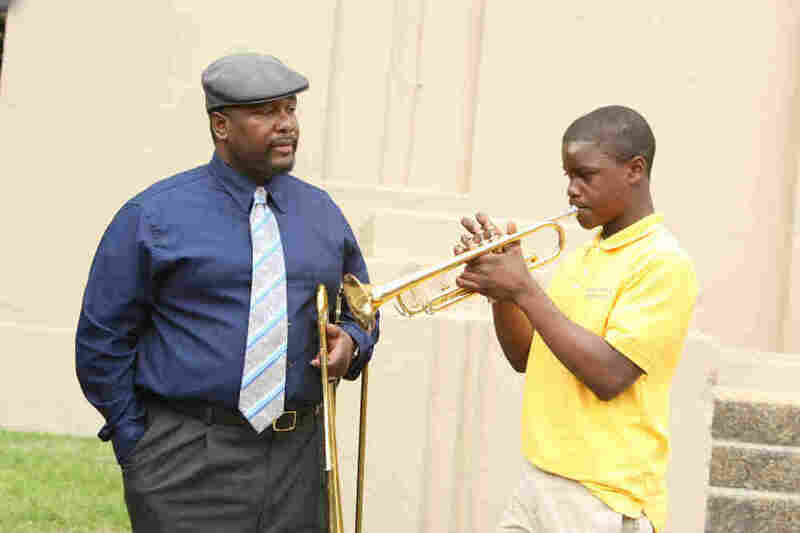 Leroy was member of the Fairview Baptist Church Brass Band, mentored by the New Orleans jazz legend Danny Barker. Jones is most often associated with the traditional New Orleans music. He swings. What has always impressed me about Leroy Jones is that he really has an identifiable sound on the trumpet, even in a city full of brass instrumentalists. I could pick him out in a blindfold test very quickly. He made two records for Columbia in the 1990s, when he was a member of the Harry Connick Jr. Big Band. That's been the extent of Leroy Jones' national attention. He remains one of New Orleans' best-kept secrets on the horn. PJ: So long as we're talking about family music traditions, we're seeing that Antoine really wants his kids to play music. Perhaps it's the slow but steady progress of his young middle-school charges — and, as he claims, a Batiste family heritage — which is driving him. JJ: I am really enjoying watching Antoine's personal growth. It really hurts him to disrupt the lineage. I still think there's time to change that. If you're a Batiste from New Orleans, you're almost predisposed to play an instrument. We've already seen pianist Jonathan Batiste appear in Delmond's band. There are a number of historical family traditions in music — the Nelson, Lastie, Batiste, Barbarin and Cottrell family names run deep into New Orleans music history. The Marsalis family, one of the city's more famous names, is actually a relatively recent phenomenon. PJ: Antoine also has a Soul Apostles gig at a place called Red Velvet. (His drummer is making due on pots and pans after his car and drum kit is towed.) They do a song called "Can I Change My Mind?" JJ: I'd still pay money to hear Herman Jackson play pots and pans, but I do miss his boom boom a little in this scene. They're playing "Can I Change My Mind" by Tyrone Davis, another great soul singer originally from the South. Davis recorded later for Malaco Records, where ZZ Hill also made a lot of soul music. I'm having a few flashbacks to WWOZ announcers like Brown Sugar and the Midnight Creeper playing "Call Tyrone" multiple times in the same program. People loved to hear that stuff. PJ: Finally, Annie and Harley (Steve Earle) take the last scene of this episode. We hear a great duet on the Steve Earle tune "This City" — nominated for an Emmy — and finally the well-rehearsed big reveal of "After Mardi Gras." It took literally "until Mardi Gras is through" to hear it, but I quite liked the chord changes in the chorus, the violin plucking, etc. JJ: Nice tune, right? We see Davis in the background hearing the debut, just like he promised. Then Louis Prima swings us outta here for the end credits with "The Music Goes Round and Around." Whoa-ho-ho-ho-ho-ho. And it comes out here.